I feel lucky to have grown up in Southern California. I remember the citrus packing houses, the sweet scent of orange blossoms, red berries bursting from low-lying vines at roadside strawberry fields. 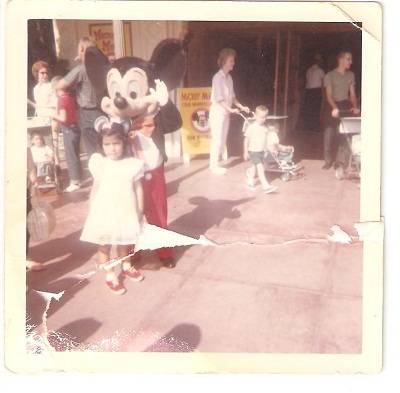 Disneyland was just a few miles from our home. 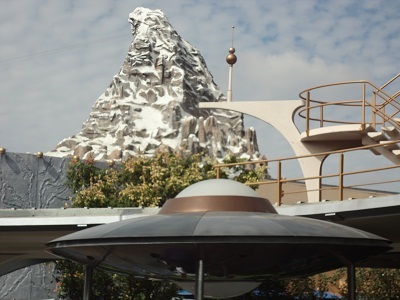 As a kid, I was mesmerized by the park’s snowcap Matterhorn Mountain. It’s peak seemed to almost touch the sky. On some days, as we drove by the amusement park, I’d spot Alpine climbers scaling the enormous mountain. 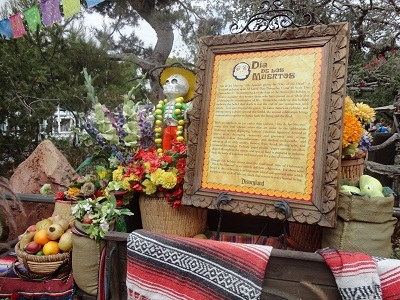 Disneyland honors Dia de los Muertos, in Frontierland, with several festive exhibits. 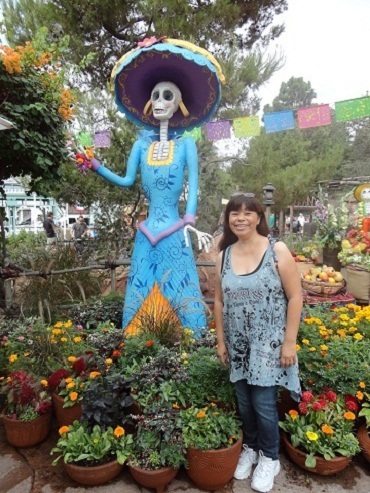 So what does Disneyland have to do with Dia de los Muertos when the Day of the Dead is about honoring the memory of our loved ones? After W.W. II, Dad worked as a cement mason. During the construction of Disneyland, he poured concrete foundations for some of the attractions, including the basin of the submarine ride. I think of Dad each time we stroll along the sidewalks of Main Street U.S.A., and again when I walk by the blue lagoon in Tomorrowland. 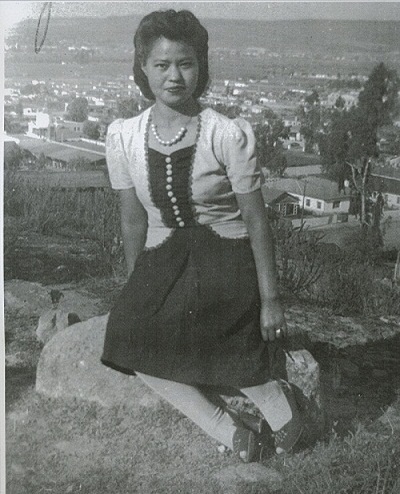 When I was six years old, she filled enough Blue Chip trading stamp books and took her six kidlets to Disneyland. I can still see her licking those stamps and pressing them into books. I can only imagine her excitement when she redeemed the stamps for park tickets. Festive altars, offrendas is a tradtional way to honor loved ones. Now, each time we visit the park, I drag hubby off to Fantasyland to ride Peter Pan’s Flight. And when the pirate boat sails through Wendy’s bedroom then dips out the window and off to Neverland, I’m six years old again and Mom is sitting beside me, pointing at all of the magical lights below. Do you celebrate Dia de los Muertos? If so, how do you honor/remember your loved ones? This entry was posted in Uncategorized on November 1, 2012 by mariacisnerostoth. Thanks for sharing your memories. I enjoyed the photos. Awww, your dad was so dashing, and what a beautiful young lady your mom was (she looked so mature for 15)! Chinese people have the Ching Ming Festival to honor their dead: on that day, they go to their ancestors’ and loved ones’ grave sites and clean them up and bring them offerings of food (which we then get to eat) and incense. Thanks, Teresa! 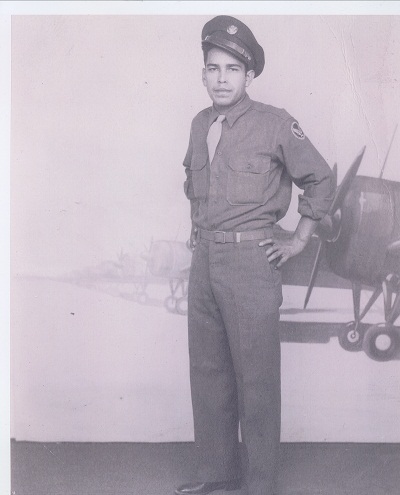 Dad was a ladies’ man, and mom was sweet, shy, and such a loving mom. She didn’t wear make-up, only a little lipstick sometimes. Your Ching Ming Festival sounds a lot like our Dia de los Muertos. 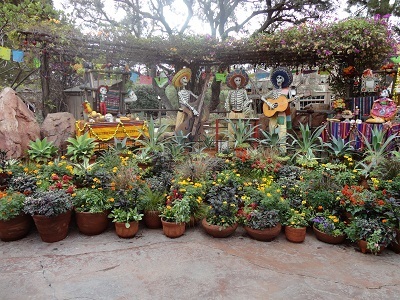 In Mexico, and even here in the states, families gather at the cemeteries and clean up the graves, take flowers, and put some of their loved ones favorite foods near the grave. It’s really a beautiful way to celebrate the person’s life. Hope you had a good critique meeting! Glad you popped on over! 🙂 I still have a Halloween hangover from all of the fun yesterday. LOL! I’m sorry to be so ignorant of your culture, Maria, because I’ve only heard of your ‘day of the dead’ once before actually. However I truly love the idea. I agree with Teresa and Steve, I thought the pics were great. Your parents were very good-looking! And I’ve had ghost stories on the brain too lately. Last night, a late night radio program called, “Coast to Coast” was called, “Ghost to Ghost.” Isn’t that great? Anyhow, I wa listening till about 3:30 a.m. AUGH! Some spooky ghost stories from callers. I love the stories, but at 3:30 a.m. I was trembling under the covers. LOL!!! Heh heh! Sign of a good ghost story if it can get under your skin! BTW… I love your blog!